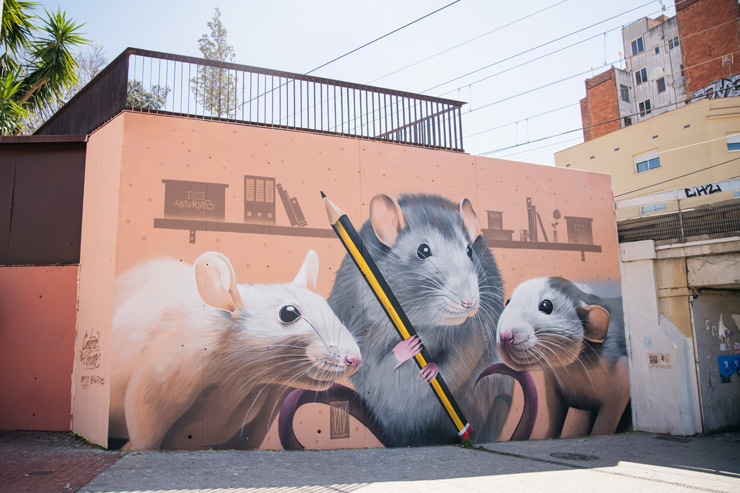 I hadn’t heard the expression “library rat” since my undergraduate university days until I stumbled across this new mural by the Spanish street artist known as Xav. The work, which was commissioned by the Barcelona-based Contorno Urbano Foundation, celebrates those of us who happily hang-out in libraries. Part of the mural art project 12 + 1, the work is located in the town of L’Hospitalet de Llobreqat just outside of Barcelona. This entry was posted in Art, Europe, Libraries and tagged Barcelona, Catalunya, mural arts, Spain, Street Art. Bookmark the permalink.